Rolled canvas comes with a white border for your own choice of frame, and is easy to mail to family or friends. 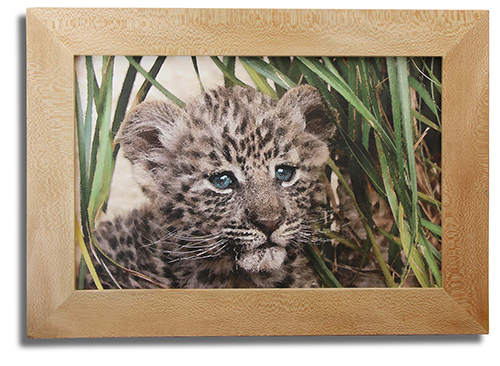 Handmade hardwood frames are 2.5" wide and hand-embellished or -varnished, with the canvas mounted on birchwood. This makes a very sturdy, relatively heavy frame. Gallery-wrapped canvas continues the print around the outside of the frame so that no visible frame is required. Small gallery wrap canvases (anything with at least one side under 18") come stretched on a lightweight frame 1.25" deep, ready to hang. 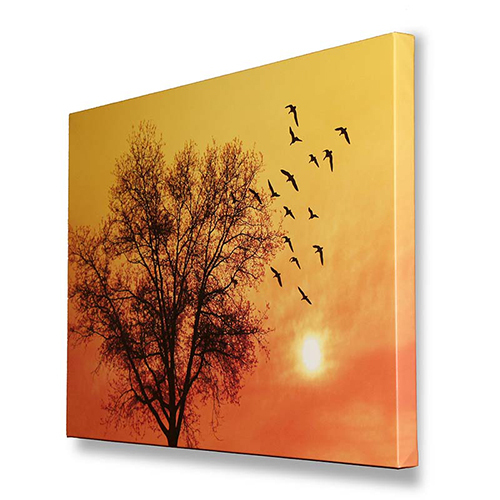 Large gallery wrap canvases come stretched on a heavy frame 1.5" deep, ready to hang. Every art print is available in a wide range of sizes and finishes. Please ask for a quote if you would like something in a size not listed. Crystal art pricing varies by size and complexity, and is available at between $10 and $200. Regular prints are available in sizes from 5" x 7" to 12" x 18". You can choose to have them as a rolled print, or complete with mat and ready to frame. Prices for these vary from $20 to $65, depending on mat size.